Cometto (Faymonville Group) has just delivered a self-propelled electric trailer type EMT 4/4 to Europropulsion S.A, a company specializing in civil space activities, in French Guyana. The project has been concluded in partnership with the Italian company Bisiach e Carrù SpA, one of the leaders in robotic activities. They were in charge of the horizontal assembly of the igniter and the nozzle of P120C (auxiliary solid rocket motor of Ariane 6 and the first stage of the Vega C launcher currently in development). 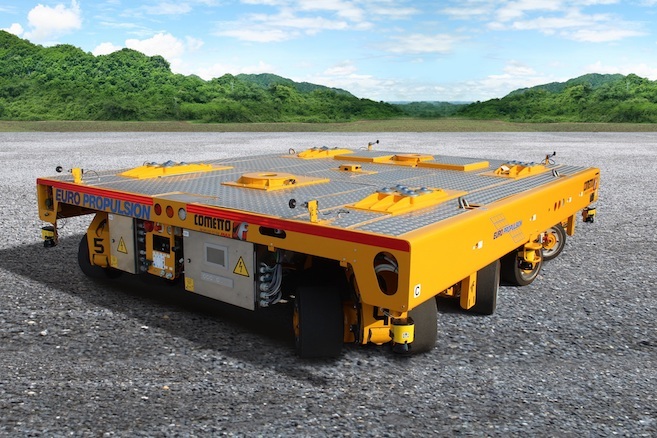 The selected vehicle, a 4-axle self-propelled transporter with a load capacity of 40 tonnes, is designed on the basis of a standard unit of the EMT series, fully electric modular platforms for on-site heavy logistics. One of its main features is the hydraulic parallel-lifting system and the floating spheres support system with hydraulic centering system. The EMT 4/4 is equipped with an optical automatic guidance system with an infra-red cameras: the EMT series from Cometto can thus be controlled by remote control or with a self-driving AGV system. Subsidiary of the Italian Avio and the French Arianegroup, Europropulsion S.A. illustrates the cooperation of the two countries on civil space activities and ensures the development and production of large solid propellant rocket motors for the European launchers Ariane and Vega under the ESA (European Space Agency ) management with French and Italian funding.